It’s easier to be green this year than the famous song would have you believe! 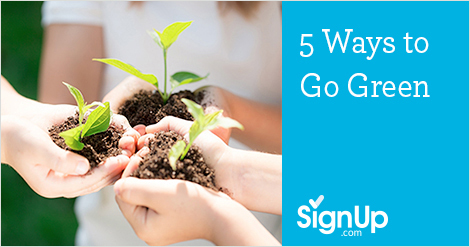 Try these eco-friendly tips to minimize your carbon footprint. 1. Eliminate disposables. Carry a glass water bottle instead of using plastics (Americans used roughly 50 billion plastic water bottles last year and only about 23% of them were recycled.) Use washable plates and cups, washable napkins instead of paper. Limit your paper towel use by employing a wash rag. Yes, these things need to be washed, which also uses resources, but the average to-go coffee cup takes 20 years to decompose and takes up an awful lot of room in the landfill. 2. Eliminate the paper trail. Use SignUp.com to organize your activities, from parent/teacher conferences to neigborhood potlucks to soccer snacks to charity fun-runs. Free sign up sheets allow access from your participants’ phones and computers around the clock, with real time eCalendar syncing and automated reminders. Eliminate the need for how-to notebooks documenting your activities for the year—keep it all on SignUp.com. 3. Reduce electricity usage. Unplug your appliances when not in use, vacuum your refrigerator coils, turn the heat/AC off when you’re not at home. Ask your electric company if there are incentives for installing a smart-home thermostat, use compact fluorescent light bulbs, and put on a sweater to avoid turning up the heat. 4. Try a Green Focus. If your volunteer group is looking for new projects, try an eco-friendly activity like planting a community garden, hosting a community clean-up, or collecting gently used clothing, toys and books to be reused by families in need. Remember to coordinate the activity on SignUp.com for paperless, easy organization. 5. Share the ride. Establish a carpool at work, or to get your kids to and from school or sports activities. “The US could save 33 million gallons of gas-each day-if the average commuting vehicle carried one additional person,” according to Rideshare.com. Organize whose turn it is to drive easily at SignUp.com and sit back and enjoy the ride! With just a few simple changes, you can go green and have an enormous impact on the planet, and a lot of fun at the same time! You may also like, Using Group Power to Get Healthy and Fit.